This course is designed for anyone who is new to the beauty industry, qualified beauty therapists and medical professionals. As well as in-depth theory, you will learn to tattoo eyebrows, eyeliner and lip liner and work on live models as well as practice skins. Terminology: Whether you call it micropigmentation training, semi-permanent make-up training or SPMU training, these terms all refer to a cosmetic tattooing course. Microblading training is a course for tattooing brows without the use of a machine. 5-day course: Days 1-4 taken together with Day 5 taken approximately 6-8 weeks later. On-going assessment and evaluation throughout your course; all parts must be passed in order to gain your qualification with us. 10 models provided for part 1 of your training and 3 for your assessment. ii. Certified make-up training (you can add an extra day). Completed treatment portfolio with a minimum of 10 treatments is required for Day 5. Pre-course study notes supplied; please allow 20 hours to complete this module. Anatomy & Physiology: The skin and face, lymph system, immune system. Health, Safety & Salon Hygiene: Your duty of care, regulations, licensing, sterilisation, disinfection & needle disposal. Client Consultation: Managing expectations, contraindications, record keeping, patch testing, medical issues to consider, pain control, after care and follow up treatments. Equipment: Getting to know your machine, needle choice, and additional equipment required for treatments, setting up your work area. Colour Theory: Identifying skin tones, choosing colours and tones, mixing colours, controlling colour performance in the skin, working on ethnic skin types. Pain Control: Legal options available and their application. Eyebrows: Shaping, measuring, hair strokes. Perfecting brow positioning: How to measure and position the brows using the Golden Ratio calculator. Eyeliner: Lash enhancement, upper and lower liner. Lip liner: Shaping and measuring lips lines, colour choice and application. Portfolio Preparation: What is expected of you, how to produce evidence for your portfolio. Marketing: How to market your treatment to existing clients and attract new clients. Introduction to Advanced Training: New skills to learn in the future. 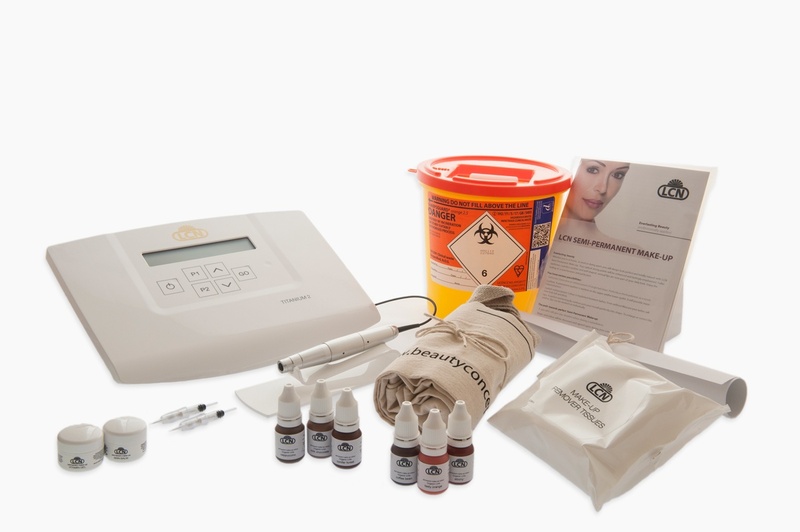 A small product package is included with the machine, including enough needles for 10 treatments. This is the perfect entry level machine, popular with our college students. It is user friendly and offers great precision. The individually adjustable needle frequency, up to 120 strokes per second, guarantees mildly invasive pigmentation with a low selected penetration depth. There are 6 needle choices for this machine as well as the 18 point microneedle attachment. Pro Kit content is subject to change. 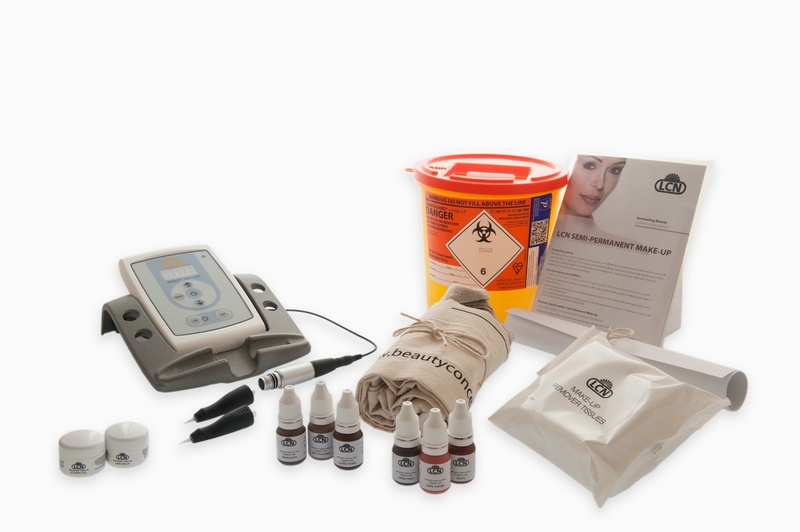 A small product package is included with the machine, including enough needles for 15 treatments. A light and compact unit that is very quiet with only minor vibration. The modern design base station has electronic controls that deliver total precision. 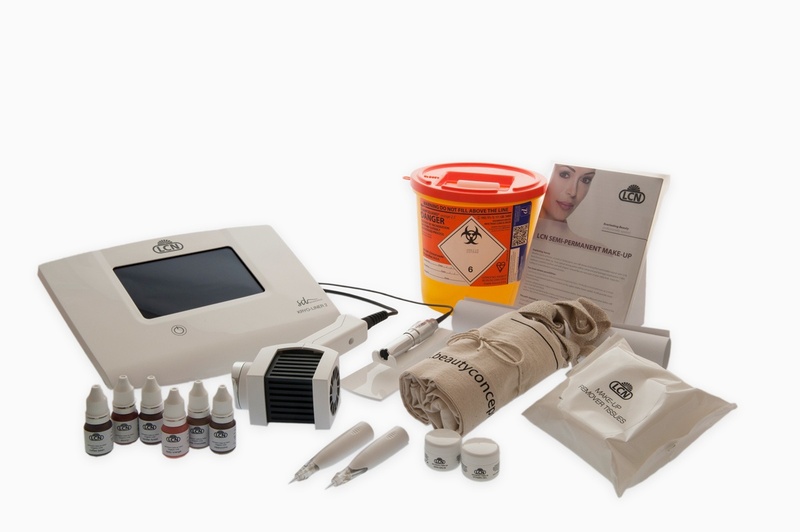 The individually adjustable needle stroke (50-150 strokes per second) guarantees mildly invasive pigmentation with a low selected penetration depth to provide excellent aesthetic results with optimal permanency. There are two hand piece connections so you can have different colours and needle configurations at the ready. There is a total of 12 needle choices as well as the 18 point microneedle attachment. A small product package is included with the machine, including enough needles for 5 treatments. A modern design that is exclusive to LCN and includes the innovated and patented SensiDrive (R) function. The unit is simple and easy to use via touch screen technology. The SensiDrive function measures the skin’s resistance and can, in addition to the extension of the needle and the hub frequency, adjust the power of penetration. The module recognition function makes it possible to show the needle configuration on the display, facilitating a precise work ow. 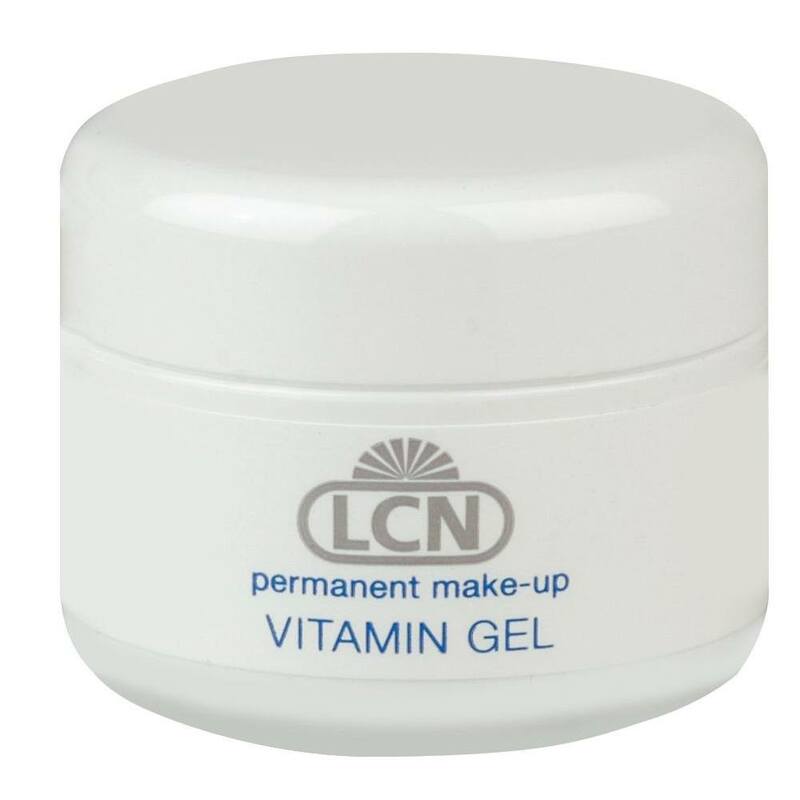 Various types of treatments (lips, brow, and eyelids) can be pre-set. A timer function guarantees an exact overview of the duration of the treatment. The hand piece offers very low vibration ensuring an even steadier work ow and the longer modules protect from contamination. The unique Kryo hand piece is a cooling applicator which cools the treatment area to the optimal temperature with pre-set programmes. 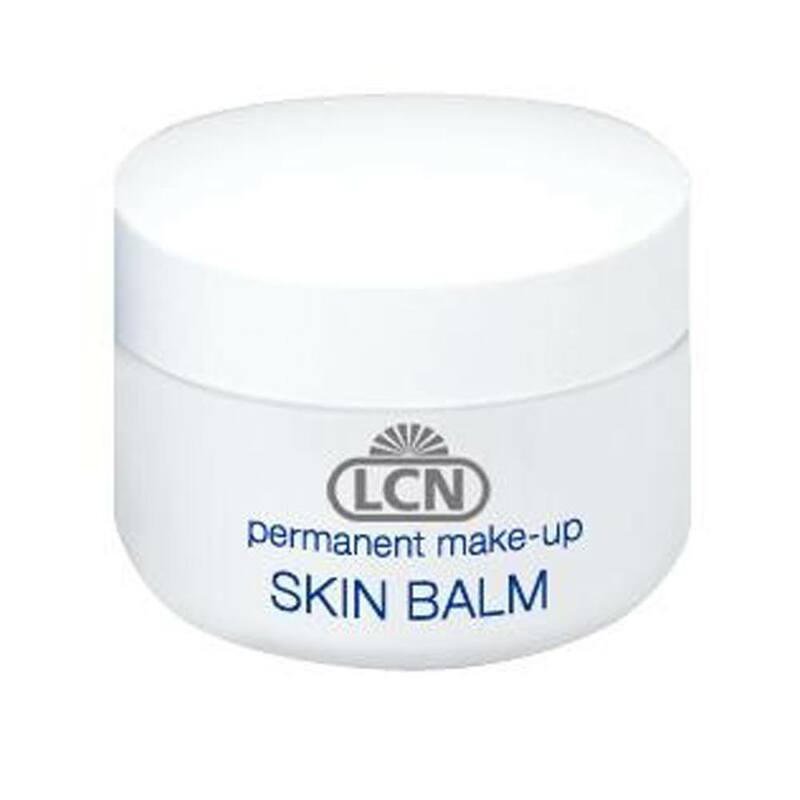 Client comfort is increased and swelling of localised tissue is reduced. 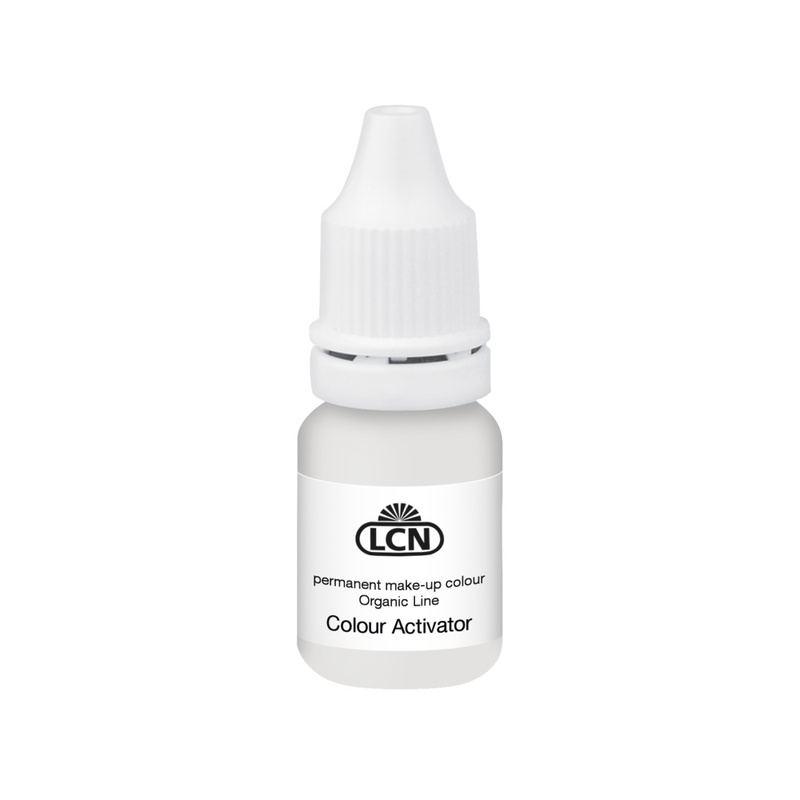 This allows perfect pigment implantation and superior pigment retention. There is a total of 11 needle choices available with this machine as well as the 18 point microneedle attachment. If you would like to fill in your details on our course enquiry form we will be in touch with the next available course dates. Please tick the box to consent to the collection and use of your personal information by LCN UK. In order to create a LCN UK client profile, we will need to collect some personal information. LCN UK is committed to protecting your privacy and respecting your data. Any personal information which we require to offer our services, is kept only with your consent and is kept secure. We do not share your data with any third parties. We’d like to stay in touch so that we can provide you with exclusive offers and information about other products and services that we believe would be of interest to you. LCN UK is committed to protecting your privacy and respecting your data. Any personal information that we require to offer our services, is kept only with your consent and is kept secure. We do not share your data with any third parties. If you would like to speak to our friendly team about our beauty courses, then please call us. Lines are open between 9am to 5pm Monday to Friday.